You decide you want to become a fishing boat captain. You’ve bought the boat, you have all the navigational equipment, and you’re ready to go catch some fish. However, when you reach the fishing spot you find that throwing nets and navigating the boat are hard to do at the same time. You need a crew to help. Being a content marketer is similar to being a fisherman: you are trying to “catch” an audience for your content. Having someone like a virtual assistant can allow you to navigate and plan out the business while they perform the smaller, but equally important, tasks. First, you should ask yourself, “What do I feel comfortable delegating?” Even if you delegate a few small content marketing tasks to your VA, you will free up your time to focus on the bigger picture. In fact, 51% of marketers cite a lack of time/bandwidth to create content as their biggest challenge. 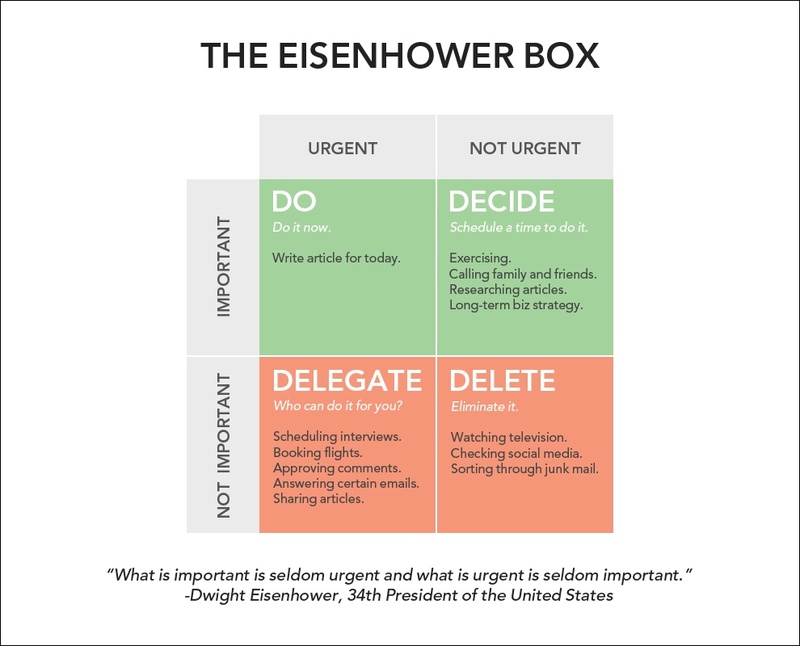 A quick and easy delegation technique you can use is to consult the Eisenhower Box, a simple decision-making tool that can help increase your productivity. When a task is urgent but not important, ask, “Who can do it for me?” A lot of your day-to-day business activities can be delegated: scheduling, email, content management, and customer engagement just to name a few. Here are some content marketing tasks you can start delegating to your VA today. A virtual assistant can be a valuable tool for figuring out your overall content strategy if you don’t already have one. As an outside observer, they can aid in clarifying your brand’s voice and tone so you remain consistent across all platforms. You can delegate time-consuming tasks such as tracking audience metrics, researching hashtags, perfecting your content SEO, etc. The key is to establish a good rapport with your VA and communicate your vision. It is important to remember that most VAs specialize in the implementation of the content strategy and not the sole creation of it. Therefore, it is important to define exactly what you expect from your VA and pay accordingly. One of the beautiful things about having a second pair of eyeballs on your work is that those other eyeballs can see things you cannot: that is, trapped content. Anything you’ve shared in one medium or context that can be used elsewhere is trapped content. Your old interviews, webinars, and podcasts? Content. Worksheets, email threads, and social media posts? Content. Your run-in with the local crazy woman at the supermarket? Yes, that’s content, too! You never know when old content can be repurposed and applied to your current projects. A trusty virtual assistant can help do the heavy lifting by condensing your longer content into shorter formats. They can convert a video blog to a written blog, take excerpts from your podcasts, reformat and post old content to social media, and even proofread and ghostwrite your articles. All of these “boring” processes can be turned over to a VA and even help with curating new and better content. Virtual assistants are often tech-savvy people. They can help with automating many of your content marketing practices and free time up for the both of you. Sites like Buffer and CoSchedule can help you automate the social media and blog posting process and Asana can help you manage workflows with as much or as little control you want over the minutiae of your marketing campaigns. Also, don’t forget that your VA can also help with the hum-drum business stuff like invoicing, creating expense reports, and bookkeeping. Admin tasks are a great way to free your time up for attracting more readers and sharers. Designing great creative assets takes time. When you only have 24 hours a day to run all aspects of your business, any creative project can quickly become a time-consuming monster. Luckily, you can offboard tasks like image sourcing and creation by using popular and accessible graphic design software like Canva. With the help of sites like Canva, you don’t necessarily need a full-fledged graphic designer on your team. Instead, utilize your VA’s creative skills, and they can deliver an excellent product in often less time than it would take you! Just like donut holes, cookie platters, or 20-foot subs, your content is made for sharing! Your VA can help create monthly editorial calendars, respond to customer questions on blog posts and social media posts, and help increase your business visibility by scheduling consistent and engaging content. Your VA can also keep you honest about your posting schedules through applications like Google Calendar and Asana. They can even create summaries that can guide your future planning and create strategies for posting at the best time of day. You don’t have to go it alone! It might seem like a luxury at first, but having a good virtual assistant not only can lessen your workload but also keep you accountable to your business goals. VAs can save you time, save you money, produce quality content, and promote your business. Are you ready to offboard some of your content marketing tasks to a virtual assistant? Contact us today to set up a discovery call and find out how Don’t Panic can help!